The Albert Embankment is on the east bank of the Thames and was created by Sir Joseph Bazalgette out of Fore Street, numerous small timber and boat-building yards and reclaimed land. This embankment is one of three built by Bazalgette, the Victoria and Chelsea embankments being the other two. The main reason for building the embankment was to protect the low-lying areas of Lambeth from flooding during high tides and heavy rain. It also provided a much needed roadway to bypass the congested streets of the area. Work started in July 1866 and it was opened on 24 November 1869. It cost £1,014,525 and is about a mile long. Part of the cost was recovered by selling 8.5 acres of reclaimed land to the governors of St Thomas’ Hospital which had been evicted from Southwark to make way for railway works. Bazalgette pioneered the use of Portland cement in his building works as it is very strong (compared to the then more widely used roman cement) and also waterproof. This cement was a recent development and Bazalgette insisted on strict quality control measures, another first in modern civil engineering. During construction, pieces of pottery were found that came from the numerous potteries that covered the area dating back to Elizabethan times. Royal Doulton carried on the local pottery tradition with a factory and studio until 1956 when the firm moved to Burslem in Staffordshire. WH Smith also had a distribution centre here, which was replaced by the International Maritime Agency Organisation. Other parts of the Albert Embankment have also been redeveloped, including ‘Parliament View’, a prestigious block of apartments, near Lambeth Bridge, and a new hotel. 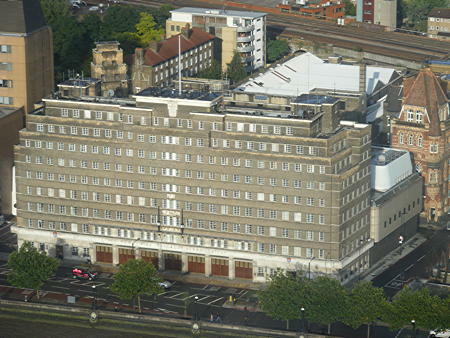 Close by are the London Fire Brigade Headquarters, designed by E.P. Wheeler and opened by George V in 1937.